The ‘Digital Literacies as a Postgraduate Attribute’ project was run at the IOE between 2011 and 2013 and is one of twelve recent JISC projects in the broad area of academic literacies. A newly published IOE LibGuide: Digital Literacies in Higher Education summarises the findings from the IOE study. Though the research project focussed on postgraduate students (the IOE being mainly a postgraduate institution until its recent intake of undergraduate students in 2012), the findings share similarities to other user behaviour studies such as the Google Generation and User Behaviour in Resource Discovery studies which focus on undergraduate students. The IOE study considers the diversity of the IOE postgraduate student experience, the increased mobility with reference to their learning, the implications of pervasive technologies, the time pressures that students are confronted with, the problem of information overload, students’ transitions and trajectories, the complex contexts in which students usually work, their view of the support systems available to them and their resilience manoeuvring around the digital library and other online environments. The study’s conclusions are many but of note is that digital literacies cannot be understood in isolation – digital literacies must be considered holistically alongside the myriad skills and technologies required by students to function effectively and efficiently in digital environments. Further, digital literacies change over time – they are not a static skills as people learn and forget and re-learn what is required of them as and when it is necessary for them to do this. The ubiquity of mobile technologies and therefore information overload require students to learn other skills such as, for instance, time management and the ability to manage digital identities. There is much more in the guide including the various implementation projects relating to developing digital literacies at the IOE. 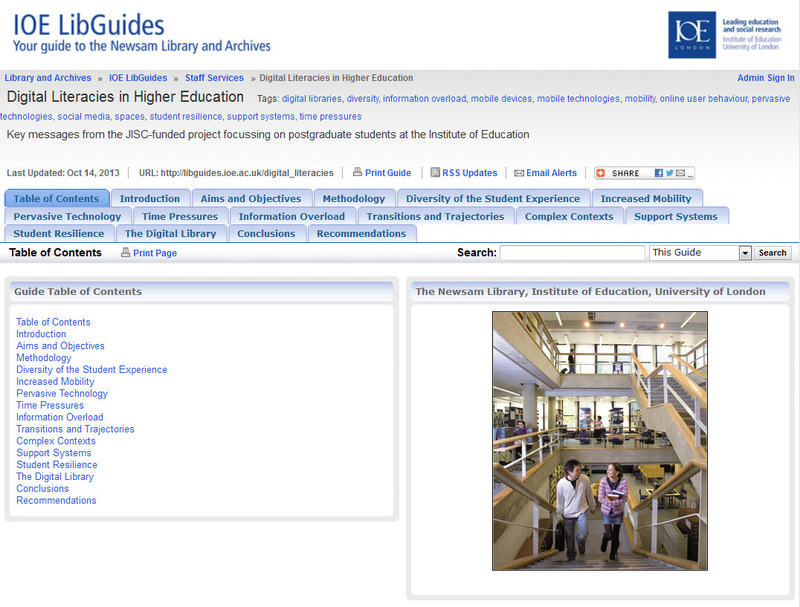 The guide is available at http://libguides.ioe.ac.uk/digital_literacies. This entry was posted in Research Support and tagged academic literacies, digital library, digital literacies, information overload, JISC, online resource discovery, pervasive technologies. Bookmark the permalink.